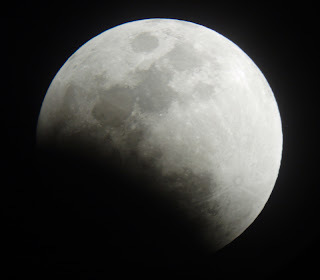 Moonlight is Sunlight that is reflected off the Moon to us on Earth, Earthshine or the Da Vinci Glow is caused by Moonlight reflected back off the Earth onto the Moon, or doubly reflected Sunlight. Called the Da Vinci Glow because Da Vinci first said the "ashen glow" was Sunlight reflected off our Earth back onto the Moon, before Leonardo figured it out no one knew what it was. Got a couple of cool images a couple weeks ago, again I am amazed my camera worked , -35c. 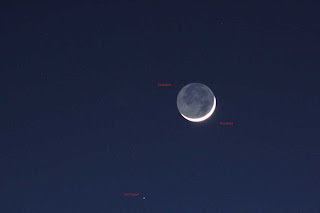 Best time to view Earthshine is during the crescent phase of the Moon and as it is setting. You can see the neat affect the Earthshine has on the Moon, it lights up the Moons dark phase so you can see the outline of the seas and the Moon itself. 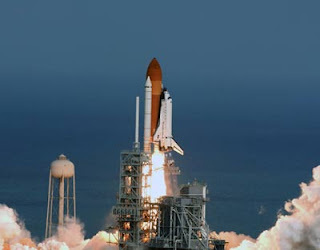 STS 123 Shuttle Endeavour has a scheduled launch date of March 11 at 2:30am from the Kennedy Space Center. The Endeavour will be delivering and installing the first section of the Japanese Kibo science research facility on the ISS , as well as delivering and installing Dextre, a two armed robot with the ability to carry out maintenance work that would have been done before by spacewalking astronauts. I'll leave you now with one of my current Sunsets as an animated gif. 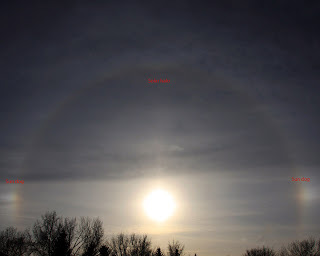 The day before E day (eclipse), I was outside and happened to notice a huge Solar halo starting to form, got my camera and headed just outside of town to capture the above halo, within 30 minutes it had formed a complete circle around the sun and had developed some beautiful colors. Just as fast as it had formed it disappeared as the Cirrus clouds broke apart, and it was no more, you can see it posted at Sky and Telescope website as well as one of my other halos. 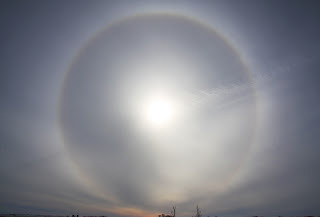 Solar halos are the result of the Sunlight being reflected and refracted off ice crystals high in the Cirrus clouds, wispy clouds located above 23,000 feet. 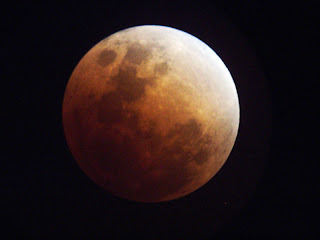 I just had to post one more image of the Total Lunar eclipse. I didn't post this image initially because it looked gray and colorless except for some blues , which I thought was just wrong, very little reds, I actually thought, great I broke my camera because of the cold weather and the taking it in and out of the house and the fact it was actually starting to make strange noises, but upon further investigation I found out the blue/ greens are a result of the Sunlight passing through the ozone layer which scatters or blocks the reds of the Sun's light, making the light getting through to the Lunar surface bluer. There was only a couple out of the many shots I took that had this much blue in it, makes for a very cool and different eclipse. I did have to put it through Photo shop curves and brightness and contrasted it to bring the browns and blues out more. There is another conjunction happening right now, Mercury and Venus are getting very close together and will be their closest February 27th. Look to the South East just before the Sun rises to see Mercury and Venus close together and Jupiter further South. I took the above image of the trio this morning around 7:14 am cst. Don't know if you have seen this video on You Tube, it is supposed to be the actual shooting down of the US Spy Satellite, pretty cool video. I'll leave you now with my Solar halo on reflecting water. They were calling for snow right up to the day before, but those silly weather guys were wrong, the weather was great, got some good pics of the eclipse, makes me a happy Bob, got a picture of the February Full Snow Moon and a picture of a Total Lunar Eclipse all in the same night, the last Total Lunar Eclipse till 2010. Native Americans called the February Full Moon, "Full Snow Moon" because it was usually the month with the heaviest snow falls and hunting became very difficult, in fact some North American tribes such as the Kalapuya called it the Full Hunger Moon. 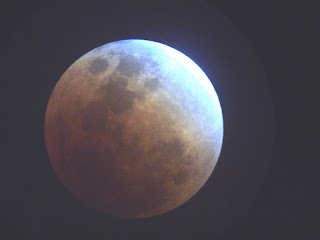 Some interesting facts about an eclipse; during totality the Moon's brightness is reduced by a factor anywhere from 10,000 to 1,000,000 times; during an eclipse the Earth gets between the Moon and the Sun, the reds and oranges of the lunar eclipse are caused by the Sun's light passing through and being refracted through our Earth's atmosphere which scatters or blocks the blues and allows the reds and oranges of the Sunlight through to the Lunar surface much in the same way it does for Sunrises and Sunsets, in fact the color of the Moon during totality is the direct result of all the Sunrises and Sunsets happening simultaneously around the world at the time of the eclipse. If the Earth had no atmosphere, the Lunar surface would be totally black. 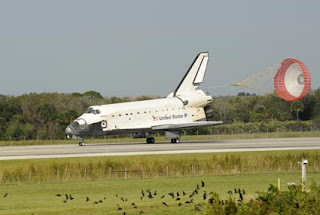 Some more great news, Shuttle Atlantis and her crew landed safely Wednesday at 9:07 am EST. after a successful mission to deliver Europe's first permanent orbital laboratory to the ISS. During it's 13 day mission Atlantis circled the Earth 202 times covering 5.3 million miles. UPDATE: The US shot down the spy satellite late Wednesday, they figure they got the fuel tank. 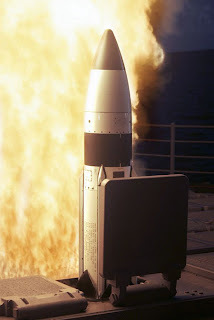 The missle was launched from the USS Lake Erie from the Pacific Ocean west of Hawaii at 10:26 EST. over 130 miles high and 24 minutes after the launch. Due to high swells in the North Pacific the US has missed it's first window of opportunity to shoot down the crippled spy satellite Wednesday, they have another 10 days to give it a go before the satellite will tumble to the ground and supposedly release it's toxic gases. I'll leave you now with my latest Sunset as an animated gif. Finally people I have benefited in a large way from these stupid cold -35c temperatures in the form of very cool Sun dogs and Solar halos, because that's when these puppies come out to play. Sun dogs are bright circular spots on a Solar halo, they are caused by the sunlight reflecting and refracting off ice crystals in the high Cirrus clouds. The Earth's Cirrus clouds are wisp like clouds located above 23,000ft. 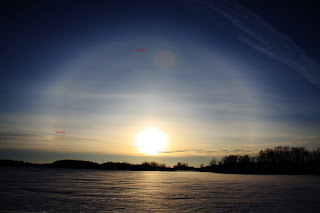 White Sun dogs and Solar halos are caused by reflection, colored Sun dogs and Solar halos are caused by refraction. The first image was taken behind the mall I work at, got two dogs and a halo, by the time I got to my second location out in the country I lost a dog, very fast changing phenomenon, but I gained a jet and it's contrails, very cool, the jet looked like it was going to crash into the Sun, so now the final image kind of looks like a giant old fashion speedometer. I've posted here about a large U.S. spy satellite falling uncontrollably from space, a little update here. President Bush has Dispatched 3 warships to the northern Pacific Ocean, west of Canada for next week's firing of a missle to take out the spy satellite. U.S. officials have stated the reason for the shootdown is to prevent deadly fumes from the satellites on board propellant from escaping into the atmosphere. This action will of course prevent the Russians and Chinese from getting their hands on the satellite as well as give the military great target practice. I have been stockpiling awards lately so thought I better get to awarding them to some other fine bloggers. Awards are great, they share the love and let a fellow blogger know you appreciate their efforts. I just wish, well I don't want to seem like a greedy Bob, but if somehow money was involved, man if I had a dollar for every award I've received I'd be a ..... wait, .. no that ain't going to work, .... let me see, carry the 6 divided by 2, times 1,000, okay, if I had $67,000.92 for every award I've received I'd be a millionaire, wild eh? Go Smell The Flowers has started the Flower Smeller Award, to be awarded to someone who is in their own way stopping to smell the flowers, has made waves in the blogging community, raised a family , got a promotion, is discovering their greatness, and the list goes on. The neat thing about this award is that you can award another 5 people next month and the month after that, till eternity, or you stop blogging, what ever comes first. JD has honoured me with this award, I've been a fan of JDs for ever, drop by his place, you'll find stunning images and stories that'll keep you on the edge of your seat. The 5 people I would like to present this award to this month, like I'm going to remember to do this next month, but who knows, anyways back to the awards. 1. Anna; great stories and photos, especially her Moon shots, which is how I found her, I thought great someone else who likes the Moon, we've been blogging together ever since. 2. AngelBaby; a very positive blog about all things angel, a very uplifting site indeed. 3. Livingsword; just discovered this blog not to long ago, excellent stories and messages, if you are a Survivor fan there are updates to be had there as well. 4. Max; another blog I've discovered just recently, excellent stories and messages as well. 5. Swubird very interesting site about his experiences in the military, and so much more, the neat thing is he has lived though a lot of cool stuff and has many stories to tell. Quick reminder, this coming Wednesday February 20th. 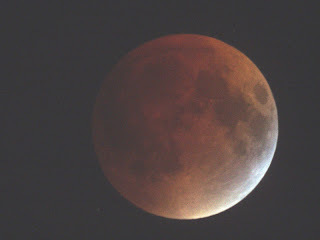 starting at 8:43 EST the last total Lunar Eclipse till 2010, snooze you loose. I'll leave you now with an animated gif of one of my Solar halo shots. "We choose to go to the Moon,..... we choose to go to the Moon in this decade and do the other things, not because they are easy, but because they are hard." Between 1968 and 1972 NASA sent 24 men to the Moon, out of them 12 walked on the Moon, out of that 12 only 9 are alive. In The Shadow Of the Moon, a documentary about the Apollo astronauts was released on dvd yesterday. I picked it up, watched it and must say it is excellent. There is a lot of rarely seen footage, example, when Neil Armstrong was looking for a smooth place to land the Lunar Module, it shows the capcom (capsule communicator, always an astronaut by the way) on film talking to Armstrong, very cool. There is lots of interesting film, but the main thing are the astronaut's interviews, what comes across very quickly is the profound affect travelling to the Moon had on each of their lifes. "Science and technology allowed me to go the Moon, but now what I was feeling, at that moment in time, science and technology had no answers. because there I was and there you are, the Earth, so dynamic, overwhelming, I felt the world had too much purpose, too much logic, it was just too beautiful to have happened by accident, there had to be somebody bigger then you , bigger then me, and I mean that in the spiritual sense, not a religious sense, there has to be a creator of the universe who stands above the religions that we ourselves create to govern our lifes." Gene Cernan, Apollo 10 and 17 astronaut. As far as the Moon itself Mike Collins the command module pilot for Apollo 11 stated " I did not sense any great invitation on the part of the Moon to come in to its domain, I sense more, almost a hostile place, a scary place". If you are a Moon or Apollo person or someone who enjoys a good documentary, you gotta pick this one up. 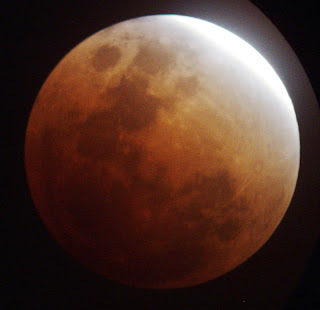 Only one more post after this one before the Total Lunar Eclipse February 20 at 10:00 pm EST. The show starts at around 8:43 pm EST. so don't miss it , last one till 2010. 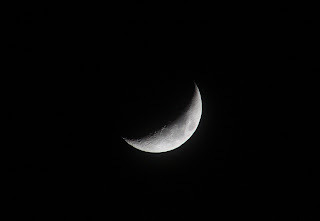 I have been practicing taking images of the Moon with the Canon 40D, as in the above 28% of full Moon image just in case I have to leave my scope behind, yes I have a plan, if it is cloudy up here in Saskatoon, I plan on heading south towards Moose Jaw, Sk, yes that is a name of a little city, not just pulling it out of a hat, Moose Jaw usually has opposite weather to us, 2 eclipses ago, when it was cloudy here, it was clear in Moose Jaw, being only 2 hrs away, it would definitely be worth it. I'll leave you now with my most current Lunar image as a gif. We add another near miss asteroid to our growing collection. First there was asteroid 2007 WD5 close flyby of Mars, then we have asteroid 2007 TU24 coming within 334,000 miles of Earth now we have a newly discovered asteroid 2008 CT1 missing us by only 84,000 miles on February 5, came from behind the glare of the Sun, didn't see it coming. Now the size is only somewhere between 8-20 metres, still it could have taken out a large city if it actually got through the atmosphere and hit us. 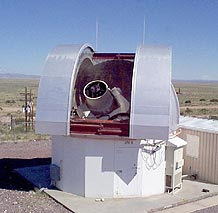 The asteroid was discovered by the LINEAR or Lincoln Near-Earth Asteroid Research Project. 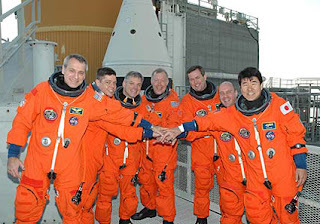 Finally Shuttle Atlantis after a 2 month delay got off the ground to deliver and install the Columbus laboratory on the International Space Station. Video shows that a couple of what they think to be small foam pieces fall of the external fuel tank 2 minutes after launch, and then another piece of foam came off about 7 minutes into the launch. The astronauts spent most of Friday inspecting the Shuttle's heat shield using it's 15m boom and robotic arms. Pilimanary findings look good, no apparent damage. On a final note, a musical note at that, NASA for the first time ever is using it's Deep Space Network to beam a song, a Beatles song Across The Universe into space, towards the North star Polaris, about 431 light years away. Had to get Yoko Ono's okay, just in case aliens have MP3 capability and do illegal downloads. The real funny part in all this is that some scientists are saying there needs to be more open discussions about the potential risks involved in sending even symbolic messages to potentially evil aliens, that's why I linked the lyrics to the song, maybe a rap song that says "come get a piece of me" over and over again, aliens could consider it a challenge and try to get a piece of us. Maybe they mean the part of the Beatles song were it says "nothing's gonna change my world" as an out and out challenge to the bad aliens, and they might see it as such and come and try to change our world, who knows for sure what aliens think. The song was sent to celebrate the 40th. anniversary when the Beatles recorded the song and the 50th. anniversary of the Beatles and NASA beginnings. I'll leave you now with another prairie sunset animated gif. Is the title I've given my most current Sunset pic. As I was out looking to take an image of a Sunset a few days ago I noticed as the Sun was sinking it was going to land on one of the high voltage towers, not really though, the Sun is 93 million miles away, but it looked cool. The Earth has the capacity to produce 60,000 megatons of energy per year, sounds like a lot until you hear the Sun produces 77 billion megatons every second, in other words, in one second the Sun produces an equivalent of a million years of Earth energy. The Sun keeps our fragile planet warm and working even in the coldness of spaceland, makes you think on how much we depend on the little star we call the Sun. Took another pic of Venus and Jupiter to show even though they are pulling away from each other they are still the two prettiest objects in the early morning sky and worthy of a peak at. Look to the SE. sky around 7:30 am, won't be long before the glare of the Sun blocks them from our view. Shuttle managers have decided that a bent radiator coolant hose isn't enough of a problem to delay Shuttle Atlantis's February 7th launch, the weather on the other hand may be a problem, 40% chance of acceptable conditions for launch. The Shuttle's main mission is to deliver and install the European Space Agency's Columbus laboratory. Remember NASA TV tomorrow at 2:45pm EST all the crazy cool camera angles of the launch. I'll leave you now with another prairie sunset video, a bunch of individual images taken with my Canon 40D and stitched together to produce what you see below. Don't wanna seem like a braggy Bob, but I got a some real cool pics of the Venus , Jupiter conjunction. The weather co-operated apart from it being -30c, the camera still working at those temps, just amazing. 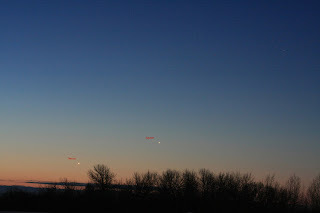 Took an image the day before and the day of to show Jupiter's dance with Venus. 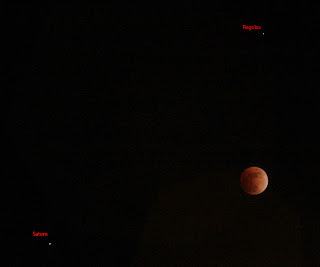 If you missed the conjunction you can still see them close together and the Moon joining the gathering on Sunday February 3rd. early morning around 8am EST. 1. 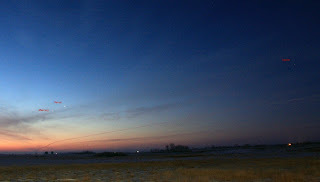 February 27, Venus and Mercury; dawn sky. 2. 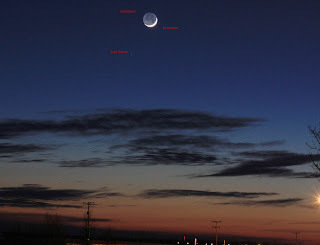 March 24, Venus and Mercury again; dawn sky. 3. 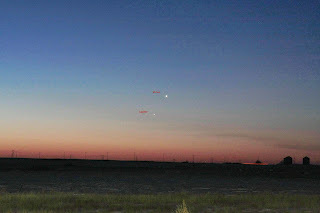 September 11, Venus and Mars; dusk. 4. 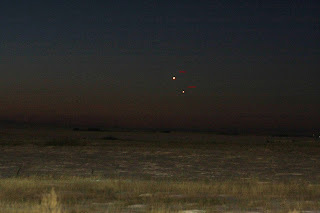 December 31, Jupiter and Mercury; dusk. 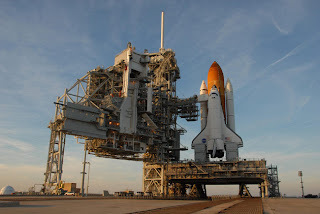 After a 2 month delay Shuttle Atlantis is set to launch Thursday February 7th. at 2:45 EST, that is as long as a bent hose for the Shuttle's radiator cooling system checks out okay. Shuttle Atlantis's main mission is to deliver and install the ESA's Columbus laboratory, if you can, check out NASA TV , they have cameras everywhere during the launch, very cool to watch. Haven't had an animated GIF which seems like forerver, so I'll leave you with what I like to call "Moonset over water", I took this image a couple weeks ago with the Canon 40D.